It has jobs with unique abilities, multiple worlds/world-maps, and characters with personalities who come and go and do useful things for you, independent of battle. Some spells have effects on your field-screen appearance and abilities. There are boats and ships and a full four classes of airship. You'll see pianos and dancers and chocobo forests, and you'll find the fat chocobo. There are light and dark crystals, and light and dark warriors. FFII has its share of features, but tends to sit out in left field as far as story, aesthetic, and mechanics are concerned. III is perhaps singularly the missing link between the original game and what has become the classical series canon. Historical import aside, FFIII presents a reasonably enjoyable play experience. The jobs system makes the early gameplay more creative and engaging than surrounding titles. Starting with four nondescript Onion Knights, the first boss battle grants you most of the familiar jobs from the first game—Black, Red, and White Mage; Fighter; and Monk (Black-Belt). A substantially upgraded Thief job is reserved for the next set. Some classes get direct upgrades later on—Knight, Shaman, and Warlock, to name a few. Others are familiar one-offs—Dragoon, Geomancer, Hunter, Bard, etc. Some, such as Viking and Scholar, have yet to be playable in another game. As I was surprised to discover, while different classes use different equipment, all classes can dual-wield to double their number of attacks (which increases from one at the start to over a dozen per round at the endgame). You can have your Fighter equip two swords, while your White Wiz can equip two staves and your Monk can equip two three-segment nunchucks…and somehow manage to avoid doing more damage to himself than the enemy. Shields, under the circumstances, are surprisingly impractical. Of course, to encourage you to go out of your way to try some of the (potentially more useless) classes and spells, the game will make story events require them. Certain dungeons are made unduly irksome by the requirement that you remain mini'd for the duration. Given that the points-per-level MP system from FFI is still in place, you can have four mage-type characters and still find you don't have enough spell-castings available to comfortably complete the area. Some areas are submerged and can't be entered if you aren't in Frog status. Others have a plethora of locked doors, requiring you to either pack a large bundle of keys or keep a Thief at the head of the party. Still others feature enemies which will replicate if attacked with any weapon except the Magic Knight's Dark Sword (as a side note, this game really drives home why a military power like Baron would want to have an army of Dark Knights and Dragoons…). It's less obvious why a military power like Baron might want to hoard airships. In FFIII, it seems everyone has them just lying around. Town taken over by ghosts? Just go to the neighboring desert where the local Cid has buried his spare. Mountain in the way? Blow it up with an airship—they're expendable. Got a regular ship? It's completely retrofittable for air travel. Get your airship blown up in a pointless war? That's okay, you can just borrow the royal airsub. Yes, airsub. See, it's like a landsub, but it doesn't sink. Until you crash it into the water. … Point is, Brian Clevinger wasn't making this one up—or playing Xenogears. 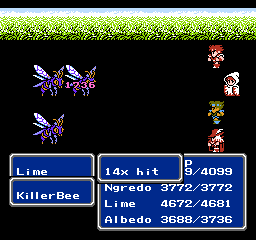 And as a side-note, nearly all of the 8-Bit Theater art that wasn't ripped from FFI was ripped from FFIII—it's just that adaptable! Beyond the mechanics and interesting travel options, the rest of the game…holds together. 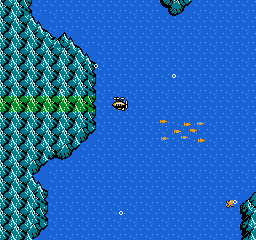 Aesthetics are the best in the NES series, with diversity of sprites and tiles, and good use of palette (save for one artifact where your guest character takes on the palette of the local townspeople…). Music is technologically practiced, if not exceptionally memorable, and occasionally hiccoughs when the menu is opened or other speed-taxing events occur. The plot tries to arc in various sections, but still often feels like a lot of traveling from point A to points unknown until you hit the point B needed to trigger the next event. But balance, pace, and scope all exceed FFI and foreshadow FFIV. 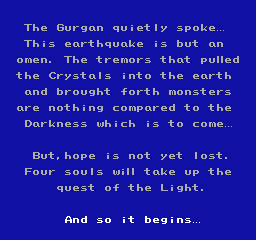 If you've never played FFIII, or only played the DS remake, I suggest tracking down the original Famicom cart so you can legally give the SoM2Freak ROM translation a try. FFIII is what it is, but it still delivers. 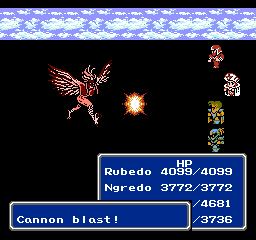 I love the FF Class system games where you have such variety, which is why I really need to get back and play III. And yes, this means I enjoyed X-2 more than I should have, simply because I love me some old fashioned White Mage costumes. Funny you should mention X-2. When I first played X, I tried X-2 out of respect for X being the first game since VI that had actually impressed me. And was disturbed and disconcerted before I even hit the world map. Then I spent a semester in Japan, learned to love the cute, broke my brain a few more times on random Japanese anime/cosplay memes, played FFIII, and made precisely the observation that X-2 is the only main-series game since V to feature a proper class system. X-2 is now back on my queue, f'real this time.